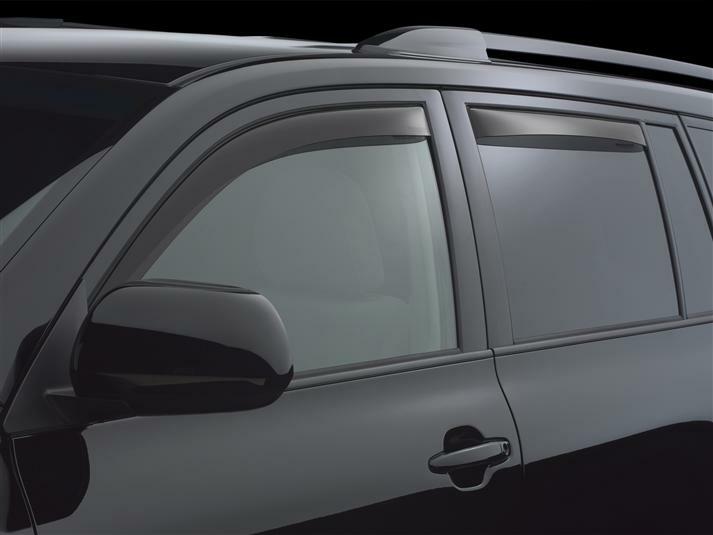 WeatherTech Side Window Deflectors are precision-machined to perfectly fit your 2011 Toyota Highlander's window channel. These low profile window deflectors help to reduce wind noise and allow interior heat to escape. Our light tinted Side Window Deflectors are the only deflectors in the world made with a D.O.T. (U.S. Department of Transportation) approved glazing material. Available in light and dark tint for most vehicles. Designed and Engineered in USA – Handcrafted in Germany. I always like to keep my driver and passenger windows cracked during the summer months to keep the interior of my vehicle cooler but can't tell you how many times a downpour came while I was away from the vehicle and you know the end of that story. I just got a new Highlander and was intrigued by these deflectors as they required no adhesives or other types of intrusive installation. I ordered a pair for my front driver and passenger windows and the installation was very easy and the fit is amazing!!! Great product at a great price. I highly recommend. We looked at all brands and installation requirements, by far Weathertech is the best out there. Love having them for hot summers and bad weather. I would definitely recommend this product to everyone! I can now leave the windows "cracked"...and that's important in Louisiana with the extreme heat that builds up due to our hot weather. I am sure the deflectors will prolong the life of my Highlander's interior...besides, they make my SUV look even cooler! I was happy to be able to install deflectors without the glue. Thanks! I BOUGHT SIDE WINDOW DEFLECTORS FOR MY HIGHLANDER AND REALLY LIKE THEM. I HAD SOME OLD TYPE WINDOW DEFLECTORS FOR MY OLD CAMRY AND HAD TO USE DOUBLE SIDED TAPE TO PUT THEM ON. THEY KEPT SLIPPING OFF AND FINALLY HAD TO RIP THEM OUT AND THROW IT AWAY. THE WEATHER TECH DEFLECTORS WERE GREAT AND EASY TO INSTALL. ENJOYING THEM ALOT AND WOULD RECOMMEND THEM TO OTHERS.